Are you considering having surgery to treat your gum disease? What if I told you there was an option that took less than half the time to complete, with a recovery period of a day, rather than up to four weeks as with traditional surgery–all for the same price? Would you sign up today? With Laser Assisted New Attachment Procedure–or LANAP–the treatment for gum disease just got a million times easier. LANAP trades the traditional scalpel and stitches for a much less painful, much more efficient dental laser. LANAP is an excellent solution to solving gum disease. It works by focusing on regeneration rather than resection–that means it removes only the infected part of your gum, leaving the important connective tissue beneath to regenerate. The LANAP method was approved by the FDA in 2004 and has been providing patients suffering from gum disease with excellent results ever since. So how does it work? To begin, it’s tiny–the laser fiber used in the LANAP procedure is only about as wide as three human hairs. A qualified dentist like Dr. Mark Makram inserts the laser between the gum tissue and your tooth. There, it removes the damaging elements that cause gum disease quickly, effectively and, perhaps most importantly, painlessly. If you’re thinking the LANAP procedure sounds far less invasive than traditional surgery, you’re right. Traditional periodontal surgery can consist of up to ten one-hour long sessions to complete treatment. With the LANAP dental procedure, though, you’re in and out in just two, two-hour sessions. And when you’re finished, you’re really finished–no aftercare visits for suture removals or other time consuming follow-ups. Recovery time after the LANAP dental procedure is lightyears ahead of traditional surgery, too. Most patients feel good enough to eat anything right after the laser procedure. Recovery from traditional surgery, however, may take up to four weeks, during which patients may be limited to a soft or liquid diet and will likely deal with swelling and a considerable amount of pain. And because the LANAP laser seals blood vessels and nerve endings, you’ll feel good right after the procedure. That means chances are high you’ll be able to drive away from surgery, missing little time from your busy schedule. The LANAP procedures produces incredible results. In fact, 98 percent of patients who chose this option have lasting results five years later. And the procedure is safe for people dealing with other health problems, like diabetes, HIV, hemophilia, or those taking blood-thinning medications like aspirin, or Plavix. If you agree that the LANAP procedure sounds like a much better option than traditional surgery, you’ll be relieved to know it costs about the same as traditional surgery. That’s right–if your insurance company reimburses for traditional gum surgery, they’ll cover your LANAP procedure, as well. If you need surgery to fix your gum disease but know the traditional option isn’t right for you, contact Dr. Mark Makram’s office today. 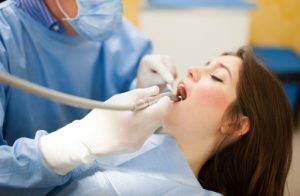 Your dentist in Naples, FL has the state-of-the-art technology necessary to provide you with the most comfortable, most efficient option in your gum disease treatment.